Sound Check: Ain’t Nuthin But A Good Time As “Rock Of Ages” Rolls Into So.Cal! ﻿﻿﻿﻿﻿﻿”If it’s too loud, you’re too old” the saying goes, particularly referring to music boasting the ‘Heavy Metal’ tag. Not so very long ago, in the strange world of 1980’s, there existed a place where the very stuff legends are born–an acid-wash epicenter known as “The Sunset Strip”! This place-and the music that was so much a part of it, was about as far from the modes and medians of Broadway as one could possibly imagine. Yet, the award-winning team of librettist Chris D’Arienzo, director Kristin Hanggi, and Musical Arranger David Gibbs (who adapted all the songs) dared to defy the Gods of Theater to fashion a musical that utilizes some of the greatest head-banging hits ever written from such iconic bands as Foreigner, Journey, Styx and many more. It’s no coincidence that quite a few of the songs presented actually debuted in the clubs that still line this mythical locale. 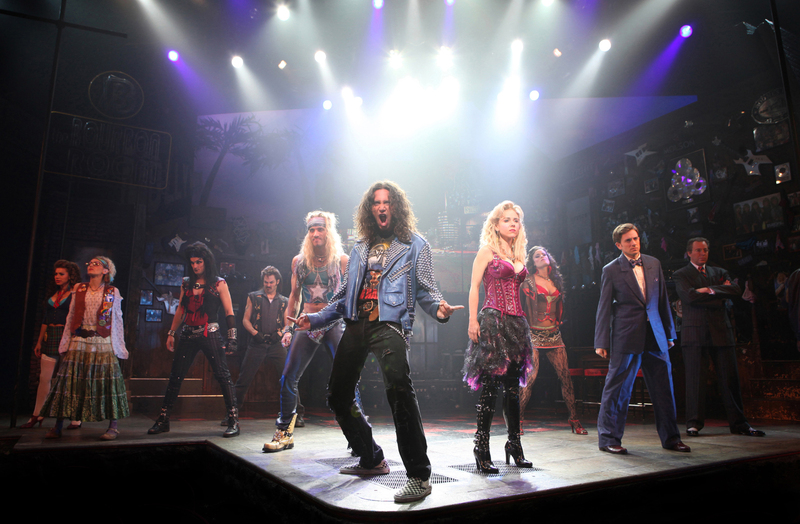 The result is a five-time Tony Award nominated smash-hit that’s something like ‘Richard Rogers’ meets ‘Riki Rachtman’, and it’s called aptly enough, “Rock Of Ages”. 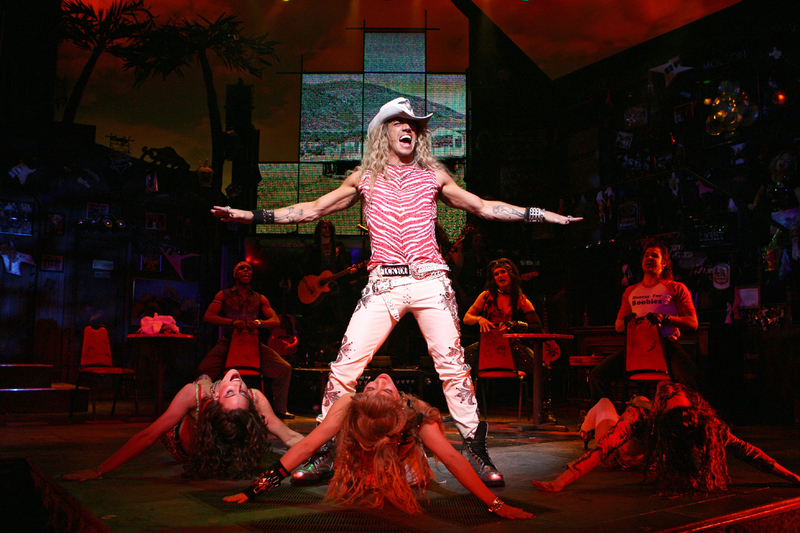 What makes “Rock Of Ages” truly unique, however, is the way it opens up the play-going experience inviting a more diverse group into the world of Musicals, who they can reach, and who they can entertain. This is what Mr. D’Arienzo meant when, after being presented with the idea for the show, he enthusiastically proclaimed “I‘m gonna make straight dudes love musicals!“ And damn if he hasn’t conjured up an mind-blowing, spandex-stretchin‘, Stratocat-strokin‘ extravaganza that does just that! Redefining what a musical can be, it shatters perceptions that they have to be fluffy, or conversely, ‘overly cerebral‘. The object here is to celebrate a time, a place and most importantly, a kind of music that hasn’t been represented much on the “Great White Way“, and while the opening number welcomes audience members to “The Sunset Strip”, it might be just as appropriate to welcome them to the next phase of “jukebox” musicals. Make no mistake though, “Mamma Mia” and “Jersey Boys” this ain’t! Once the house lights go down, we’re immediately transported back to 1987–a ’sexier’ time where “if a fella had a dream, a fifth of jack and a decent amount of hair, there was no where else to be!” There, Sherrie (just a small-town girl looking to escape her lonely world,) grabs the midnight train going–to Hollywood. Once there she meets and falls for Drew Bowie–a city boy born and raised in South Detroit (–where else?) Drew’s a man with a dream–to become a humongous rock star named “Wolfgang Von Colt”. So what if for the time being he has to work as a humble bar-back at “Dupree’s Bourbon Room”? At least it‘s the strip’s “most historic ‘Temple Of Rock and Roll Kick-assery‘ ”! America, your next BIG rockstar: Wolfgang Von Colt! The very first staging took place in 2005 at Hollywood’s “King King Nightclub”, playing four shows over a two day period. Later, in August of that year an additional performance was held on a soundstage at the Warner Brothers Studio. Then, in January 2006, a toned-up version was unveiled at The Vanguard in Hollywood where it played to overwhelming enthusiasm for six more weeks. By the time its initial tryout in “Hollywoodland’ was completed, producers were more confident than ever that it was ready for the East coast, as it began its off-Broadway engagement in the fall of 2008. Greeted with similar success, this quickly led to a move uptown to Broadway’s Brooks Atkinson Theatre Opening on April 7, 2009 where, upon garnering such widespread critical acclaim, it fast became celebrated as the sleeper hit of the season! 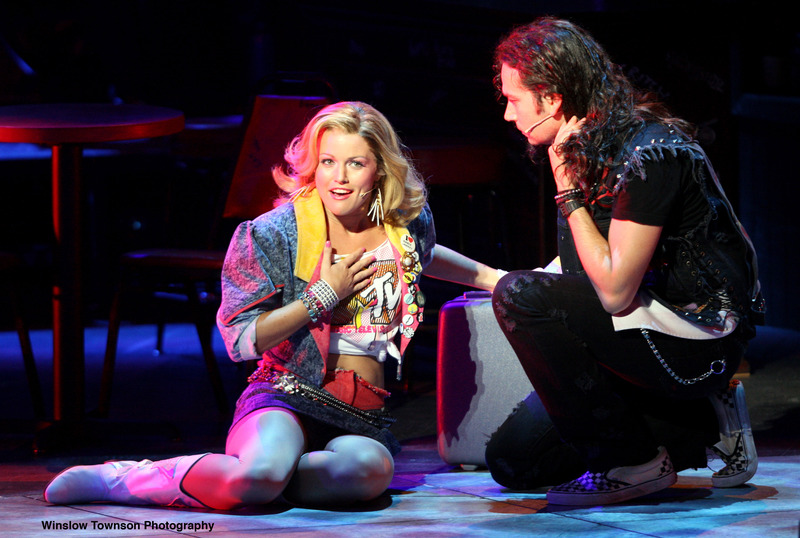 Is it any wonder then, that when the 2009 Tony Award Nomination were announced, “Rock Of Ages“ was in the running for five awards including “Best Musical”, “Best Direction Of A Musical“ for Hanggi and “Best Lead Actor In A Musical” for Maroulis?! Now at last, for those in the Southland, ‘the search is over’ as this raucous rock-n-roll sensation returns to where it all began–completing its circle of awesome success. “Opening at the Pantages is pretty heavy stuff for everyone involved with this little-show-that-could” notes Producers Matthew Weaver and Carl Levin, observing the way it has traveled thousands of miles to make the five-block journey from the ‘King King’ to The Pantages! First up is its ’official’ Los Angeles premiere at the renowned Pantages Theatre for a two week engagement starting February 15 through February 27; then afterward, the company travels southward to the “The O.C.” and the newly renamed “Segerstrom Center for the Arts” (formerly the Orange County Center For The Performing Arts) for an additional one-week run beginning March 1 though 6th . ﻿﻿﻿﻿﻿﻿Photos By ﻿Joan Marcus, Courtesy of Broadway/LA.org; Special Thanks to Benny Aguayo, Marketing Manager for Broadway/L.A, as well as the Press ﻿Relations Department of The Segerstrom Center For The Perfoming Arts for their gracious assistance in the prepartion of this story. 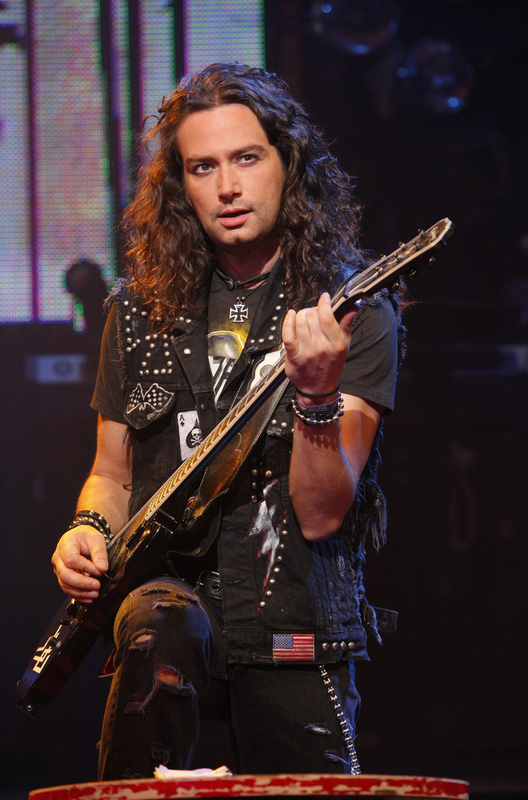 This entry was posted in Theater reviews, Uncategorized and tagged 2009 Tony Nominated Shows, Constantine Maroulis, Heavy Metal Music, Los Angeles, Musical Theater, Nederlander Organiznation, Orange County, Pantages Theater, Rock Of Ages, Segerstrom Center For The Performing Arts. Bookmark the permalink. Love your article! It took me back to my days of big hair, gawdy makeup and Flashdance inspired clothes!!! Miss my days of “Girls Just Wanna Have Fun”!!!! !